In the old days we used the standard, but recently we only use the red label. I also feel higher density than the standard. It is also excellent in durability. The price is a bit high, but considering the durability, I think it will be cheaper in total. Anyway, it's bothersome that it breaks during work and the machine doesn't move. Given that, you can only use red labels. This review is about item#8597705. The red V-belt is more expensive than the standard, but the use time is longer and the number of maintenance tasks is reduced. I will continue to use it in the future. This review is about item#8597452. I am satisfied with the V belt connecting the motor and the cotton machine firmly. This review is about item#8597617. 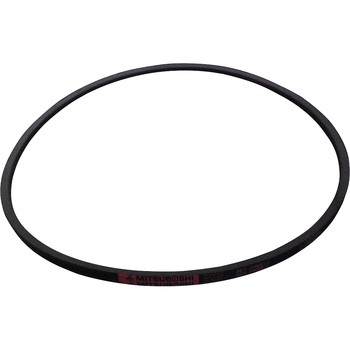 It is used for backhoe fan belts of construction machines. I am satisfied with the safe Japanese brand, and I can buy a belt of high class quality cheaply. This review is about item#8597504. I purchase it at any time and use it. The three-star belt can be used with peace of mind. Sincerely. This review is about item#8597443. Those that genuinely imported expired in 5 minutes (Why!?) The price is one-third, cheaply available, and it seems to last longer. Please again. This review is about item#9246517. Because it is used for construction machinery, we made it red, considering durability. Quality is also no problem. This review is about item#08597425. It is a consumable item, used as an exchange item. The belt I was using was replaced because it had run out. I tried to select red which is durable in any case. I think that you can feel the difference. This review is about item#08597565. Since it is durable even compared with other companies, I always use it. This review is about item#08597477. I could use it normally. It was saved because there was no size in the home center. This review is about item#9246221. We are exchanged at periodic inspection. I'm sorry, I have not used any other products, so I'm not sure. This review is about item#8597495. I always used to use it. Sincerely. This review is about item#9246151. Once you exchange it, it has nearly 10 years, so I use it with confidence. Since I use about 40 pieces, I purchase several pieces a year. This review is about item#8597635. The goods arrived early We were able to make a pleasant deal. May 3 The exchange work is scheduled. This review is about item#9246133. I ordered, arrived soon, I am satisfied with the goods. This review is about item#8597486. Improvement was made by exchanging V belt at motor abnormal sound occurrence. The cause was cracking of the V-belt. This review is about item#9246291. I like the place where you can find things you are looking for quickly with plenty of sizes. This review is about item#9246343. It arrives soon and it really helps. This review is about item#08597495. It is very strong. I am concerned about the wear of the pulley. I will study adjustment. This review is about item#08597653.